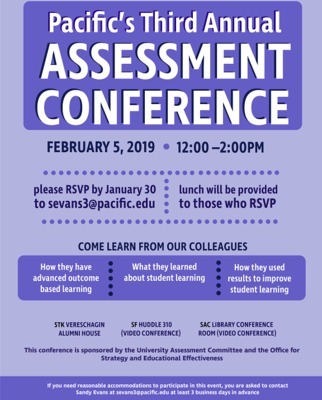 Faculty, staff, and students were invited to Pacific's 3rd Annual Assessment Conference on February 5, 2019, from noon to 2 p.m. The conference took place in Stockton, and participants from San Francisco and Sacramento could either join us on the Stockton campus at the Vereschagin Alumni House or participate via videoconference (SAC - Library Conference Room and SF - Huddle 310). University faculty, staff, and a student showcased program assessment practices sharing their creativity, innovation and expertise in assessment. Attendees had an opportunity to come learn from our colleagues! What they learned about student learning? How they used results to improve student learning? How they have advanced outcome-based learning? Presentations by faculty and staff explored the intersection of academic programs and student support services, from first day on campus to career interview, highlighting Pacific's commitment to the whole student experience.